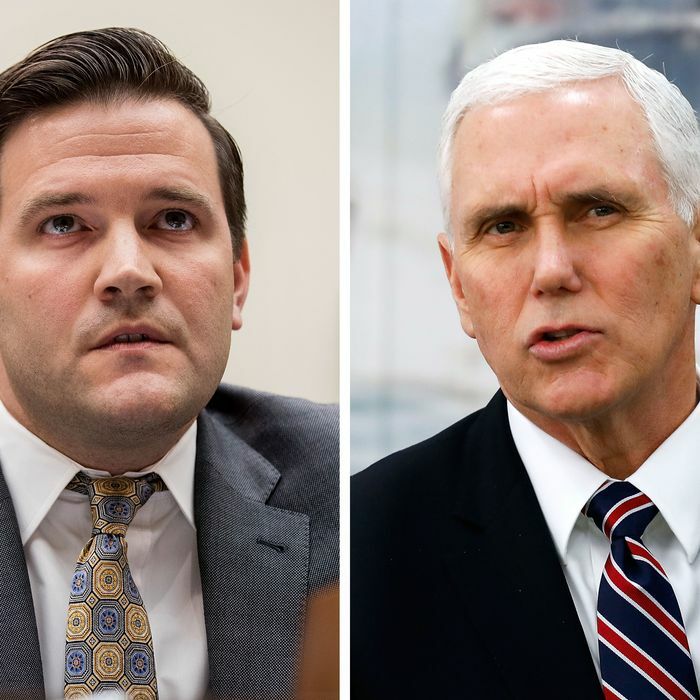 Scott Lloyd and Mike Pence, two of the Trump administration’s warriors against women’s reproductive rights. Barring a change of heart in the next three years, Trump won’t just be the most pro-life person of 2017 — he will be the most pro-life president ever. And that fact can’t be understated. Though tremendously flexible on his other campaign promises, Trump hasn’t moved an inch on abortion, and that’s genuinely surprising. I dunno about that. Trump made an unprecedented commitment to conservative legal groups that he’d let them give him a “short list” for Supreme Court appointments, with likelihood to help overturn Roe v. Wade being the most obvious litmus test. That pledge was clearly critical to the support he gained from conservative evangelical leaders in 2016, and it’s why they back him come hell and high water today (viz. Jerry Falwell Jr.’s remarkable, toadying tweet supporting Trump’s attacks on his own attorney general). With SCOTUS almost certainly just one justice away from overturning or at least significantly scaling back abortion rights, the Trump-Pence administration is on the brink of fully redeeming the RTL movement’s faith in them. That’s why the bizarre behavior of the obscure agency responsible for handling refugees (the Department of Health and Human Services’ Office of Refugee Resettlement) isn’t so surprising at all. Scott Lloyd, the anti-abortion activist in charge of that agency is clearly following his masters’ signals, though his record in battling the federal courts to deny the vulnerable young refugee women in his custody the right to have an abortion is mixed. A new report from Politico shows that Lloyd and his allies have been indifferent to legal concerns and to the normal policy-making process in pursuing their strange crusade to try to persuade or force refugees to carry their pregnancies to term. [T]he new policy was made by “political appointees at HHS,” including Maggie Wynne, an HHS counselor, and Scott Lloyd, who was then on the HHS transition team, according to the deposition of Jonathan White, deputy director of ORR. Lloyd was previously an attorney with the Knights of Columbus, a Catholic charitable organization [and fervent opponents of legalized abortion]. Wynne worked at HHS in both the Bush and Obama administrations and was previously director of the House Pro-Life Caucus. Now installed as director of ORR, Lloyd has tried to send pregnant refugees wanting an abortion to “crisis pregnancy centers” (code for anti-abortion counseling facilities); he’s jawboned them personally (which must be an intimidating experience for these young women); and he’s sought to keep them from getting to abortion clinic appointments or meeting with attorneys. The common term for what Lloyd is doing is “taking the law into his own hands,” though federal judges have succeeded in freeing a couple of women from his clutches. No wonder Senator Patty Murray is calling for his resignation. If you’re Scott Lloyd, of course, you’re just doing what your conscience and your leaders are saying in the face of an “abortion holocaust” that will soon be remembered, you hope, as a dark but temporary moment of human history. If that means shirking your job resettling refugees and maybe engaging in some civil disobedience, so what? This is what happens when you have an administration that as a matter of policy and politics is opposed to a standing but vulnerable constitutional right.